Provide comfort for the family of Elizabeth Stevens with a meaningful gesture of sympathy. 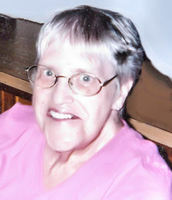 Elizabeth “Betty” Nellie Stevens, 80, passed away February 3, 2019, at a Brewer healthcare facility. She was born in Bangor on August 19, 1938, the daughter of Charles H. and Marie (Emond) Lally. Betty was very proud that she was a Salvation Army Soldier in her younger years. She enjoyed making wreaths and watching old western movies. Later in life there were many fond memories of playing Bingo with the Bangor Parks and Recreation Senior Citizens group where she had many friends. She also enjoyed going to church. She is survived by a brother, Ralph; sisters, Hazel and Bertha; and several nieces and nephews. She will be missed by the Kinney Agency who helped her for over 18 years with special staff Faith and Tracey. In addition to her parents she was predeceased by a sister Ruby. Funeral services will be held 11 AM, Thursday, February 7, 2019, at Brookings-Smith, 133 Center Street, Bangor. Relatives and friends may visit with the family from 10 AM until the start of the service. Interment will be at Pine Grove Cemetery, Bangor. Gifts in Betty’s memory may be made to the Salvation Army, P.O. Box 1101, Bangor, ME 04402-1101. Condolences to the family may be expressed at BrookingsSmith.com.